When Tadao Yoshida was 20 years old, he got some bad news: The trading company where he worked was bankrupt. It was 1934, and his future was suddenly thrown into question. But the bleak news came with an unexpected silver lining. Instead of dissolving the business entirely, the company’s owner gave the business to Yoshida so he could try to make a fresh start. To say that Yoshida succeeded would be a massive understatement. Today, Yoshida’s company is valued in the billions, with profits in the millions. It’s so big, with so many divisions, that it’s tough to put an exact number on this success. As of 2016, the company employed more than 44,000 workers across more than 130 subsidiaries in at least 60 countries around the world. 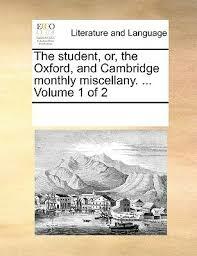 As we seek closure, we might recall that it was on this date in 1750 that the first issue of the first college student magazine, Student, or the Oxford and Cambridge Miscellany, was published.